Parents want to keep their babies as safe and healthy as possible, and thanks to new developments in wearable technologies this is easier than ever. Simple sensors that connect with smartphones, computers, or other household technologies can give nervous new parents the ability to monitor their baby’s health, safety, and well-being 8 Tech Products to Keep Your Baby Room (and Baby) Safe and Secure 8 Tech Products to Keep Your Baby Room (and Baby) Safe and Secure Bringing baby home can be a scary experience, but these ten tech products can provide you with much-needed peace of mind about the safety and security of your home. Read More 24 hours a day . 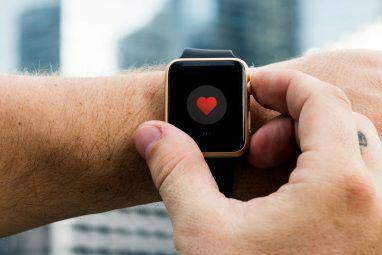 Some may see wearable monitors and other baby-related apps and technology 4 Android Apps to Help Parents Take Care of Their Babies 4 Android Apps to Help Parents Take Care of Their Babies If you're the parent of an infant, these apps could really help you out! Read More , as a way to disconnect from taking care of your child, or as a symptom of overprotectiveness. However, there’s a lot to be said for gaining peace of mind about your child, and knowing that they are breathing, safe, and sleeping soundly from any room in your house. 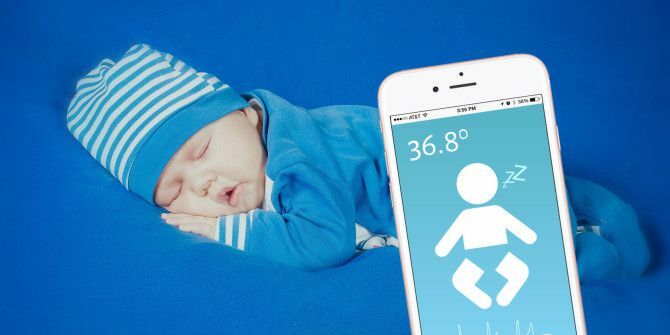 These eight new baby body sensors go above and beyond the baby monitors of old – instead of just letting you hear your baby sleeping, you can now be instantly connected to their health and well-being using only your smartphone and these innovative devices. The Mimo Smart Monitor is a small plastic monitor that attaches to one of Mimo’s specialized all-cotton baby onesies (three sizes available, up to 12 months). This baby body sensor monitors your baby’s breathing, sleeping temperature, body position, activity level, and whether they are awake or asleep. The information (with audio) is sent to an unlimited number of smartphones using a Bluetooth Low-Energy signal (currently billed as the safest kind of signal available). Better yet, the Mimo SmartMonitor can be connected to selected Nest products such as the Nest learning thermostat 13 Things You Didn't Know You Could Do With a Nest Thermostat 13 Things You Didn't Know You Could Do With a Nest Thermostat You may be surprised just how many little tricks you can accomplish with your new Nest thermostat! Read More and the NestCam, making it a valuable addition to your existing smart home system. The Owlet is another wearable monitoring device, but instead of a plastic clip, it’s housed in a sock (three sizes available, wearable up to 18 months). Owlet’s baby monitor doesn’t offer as many features as the other wearable devices, but uses simple pulse oximetry to measure your baby’s heart rate and oxygen saturation levels. This information is sent both to a base station on a parent’s nightstand, and to the Owlet app. Alerts will sound if significant changes are noted in either a baby’s pulse rate or their oxygen levels. The third wearable baby monitor in this list, the MonBaby is perhaps the most flexible of the three. Instead of requiring babies to wear a specialized item of clothing, the MonBaby monitor is a plastic clip that can be attached to any article of clothing that the baby is wearing. This monitor’s primary goal is to alert parents if a baby rolls over and begins sleeping on their stomach (generally considered to be a higher-risk position), but it also provides insight into the baby’s breathing movements, fall detection, or proximity to the parent. 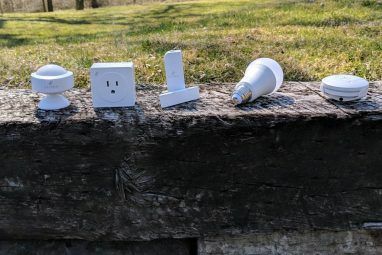 Measurements are taken five times per second, and regularly transmitted to the MonBaby smartphone app using a low-energy Bluetooth signal, which displays information and alerts in an easy to understand format. If you would rather monitor your baby without them wearing a baby body sensor on their body, you may want to consider the Mimo Movement monitor – the monitor itself looks a lot like the one used in Mimo’s Smart Monitor, but attaches to a machine-washable sheet instead of a onesie. This monitor is intended to track your baby’s movement over the course of the night, sending an alert to your smartphone if it notices any irregular patterns. 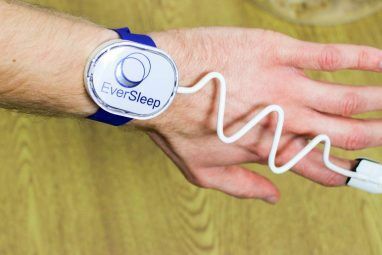 It also compiles a data output each morning that gives you information about your baby’s sleep quality, allowing you to track their sleep habits over time 6 Smart Gadgets to Help You Sleep Better 6 Smart Gadgets to Help You Sleep Better Not getting a good night's sleep is never a good way to begin a day. Luckily, there are plenty of home gadgets that can help you get a great night sleep. Read More . As wonderful as wearable monitors are, sometimes there’s nothing that reassures you quite as much as being able to see your baby sleeping peacefully. The Withings video monitor offers live streaming to your phone, tablet, or computer in high definition whether it’s day or night. Other features offered by the Withings monitor include an instant push to talk feature, which allows you to have two-way audio communication with your baby, as well as movement and noise alerts. You can also program music and LED light features for calming and comfort for your baby, potentially streamlining their before-bed routine. If that wasn’t enough, the Withings monitor also sends you a notification if it recognizes any unsafe levels of volatile organic compounds in the environment, and stores your video feed from the past 48 hours, giving you a chance to replay or save any special moments. Your data is encrypted with bank-level security to ensure that your privacy is protected at all times. Distracted driving is a huge problem Do Everything in the Car Hands Free With Google Now Do Everything in the Car Hands Free With Google Now You don't have to text and drive. In fact, you can do a lot with only your voice while driving -- even more than texting! Read More – and in this case, having technology may actually help decrease risk while driving. The Garmin Baby Cam attaches to a headrest in your car so that you can keep an eye on your baby without having to pull your car over or turn your head around to look in the back of the car. The video feed (which works in both daylight and in the dark) goes directly to your Garmin GPS (and can be accessed with the touch of a single, easily accessed button). It isn’t risk-free (and may be illegal in some jurisdictions because of its video properties – check the laws in your country/state), but its access has about as much risk as changing a button on your radio, and can offer you some much-needed peace of mind. It’s incredibly stressful when your baby is unwell, so these FDA-approved thermometers are trying to put parents a little more at ease. The Kinsa Smart Thermometers come in two models – a classic oral temperature model (SmartStick, $19.99) or an in-ear thermometer (SmartEar, $49.99). Both models take your child’s temperature in seconds, and immediately send the information to your smartphone through your headphone jack. The app tracks temperature data, symptoms, diagnoses, medication doses, and other notes in a log and can track information for multiple family members simultaneously. The app even goes so far as to offer guidance on next steps and to indicate when you should seek medical attention – not that your technology should be a total replacement for medical opinion 10 iPhone & iPad Health Accessories for iHypocondriacs 10 iPhone & iPad Health Accessories for iHypocondriacs Though the healthy living advice we receive sounds simple enough, putting it into practice can actually be quite difficult. That's where your iPhone comes in. Read More , but this information can be a great resource for worried parents. While the Kinsa thermometer has a few more features, and can be used by people of all ages, it may be distressing for some young children to experience a thermometer that goes in their ear or mouth. The Pacif-i is made to look and feel exactly like a classic pacifier, allowing you to gain insight into your child’s health without causing them any distress. The Pacif-i sends information to your phone using a low-power Bluetooth signal, and data can easily be shared with other devices as well. If the Pacif-i gets lost, you can quickly locate it by pressing a button on the app (which will cause the pacifier to begin beeping). This device is suitable for children ages 0-3 years. Technology has definitely changed some aspects of parenting – you can now visit websites for parenting advice, need to ensure your child’s safety online 7 Family Safety Tools To Keep Your Kids Safe Online 7 Family Safety Tools To Keep Your Kids Safe Online Like the real world, the internet can sometimes be a scary place for your kids. There are some great apps and tools to keep them safe; here are some we think are the best. Read More , and you may even teach your child life skills using technology 11 Tech-Savvy Ways to Teach Life Skills to Your Kids 11 Tech-Savvy Ways to Teach Life Skills to Your Kids Parenting deserves to be stress-free. Take childhood development a step further with these online tools that can help you nurture strong motivations and values in your kids. Read More . There isn’t a definitive, one-size-fits-all judgment call when it comes to using technology in parenting – do you think these baby monitoring tools are more harmful or helpful? Has your family used any of them? I’d love to hear your thoughts in the comments! Explore more about: Smart Sensor, Wearable Technology. Those baby item you mentioned is our daily usage stuff, who have babies. Because without them is not easy to raise a baby. I am glad you shared the price range, it'll guide me when I need them in my life. My cousin bought baby items from Kokopax for her kinds.